Your Trip to Croft Farm!. Accommodation! 4 person cabins Bunk beds Children will need to bring a sleeping bag and pillow with them. 1 Your Trip to Croft Farm! 2 Accommodation! 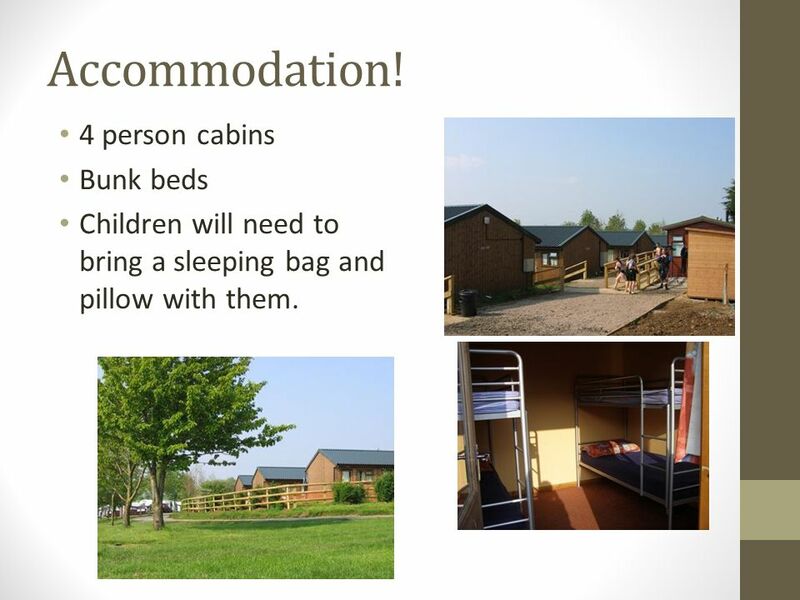 4 person cabins Bunk beds Children will need to bring a sleeping bag and pillow with them. 3 Food! Children will be provided with 2 hot meals a day and a lunch. 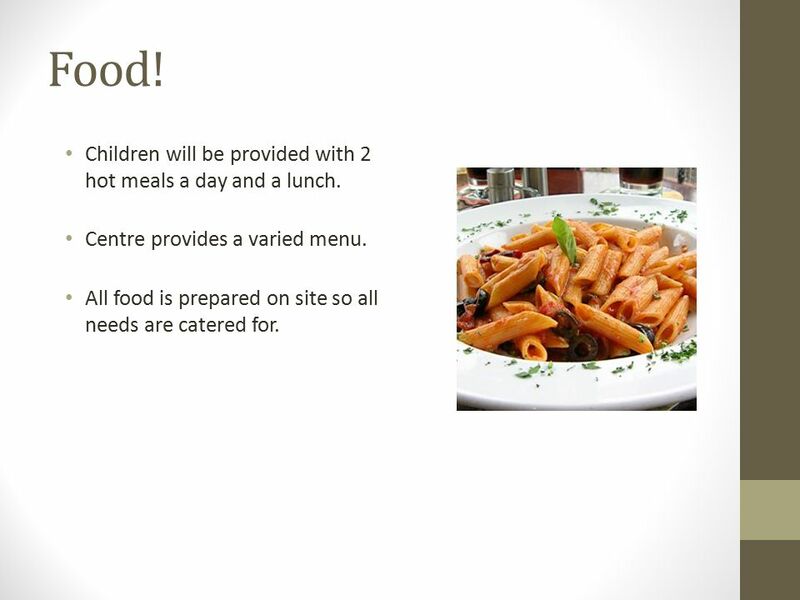 Centre provides a varied menu. All food is prepared on site so all needs are catered for. 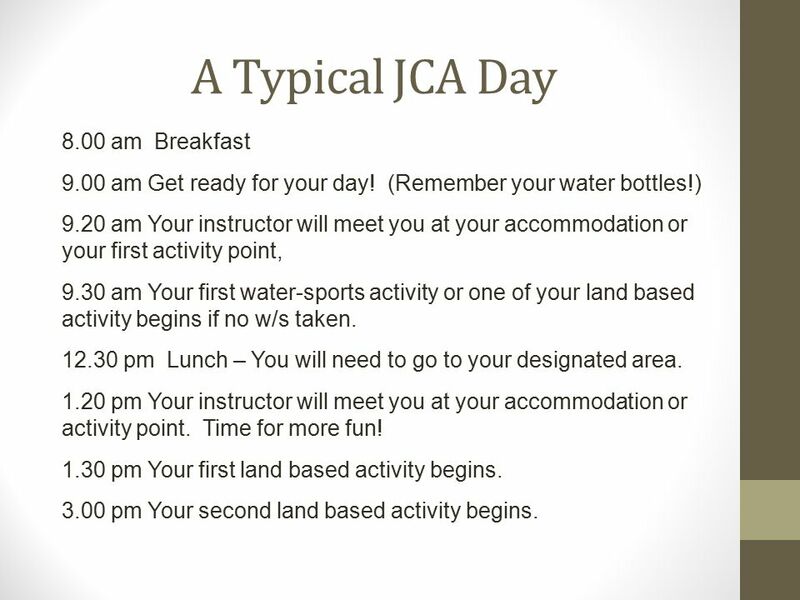 5 A Typical JCA Day (cont) 4.30 pm Free-time* – 5.20 pm Arrive ready for your evening meal. 5.30 pm Evening meal. 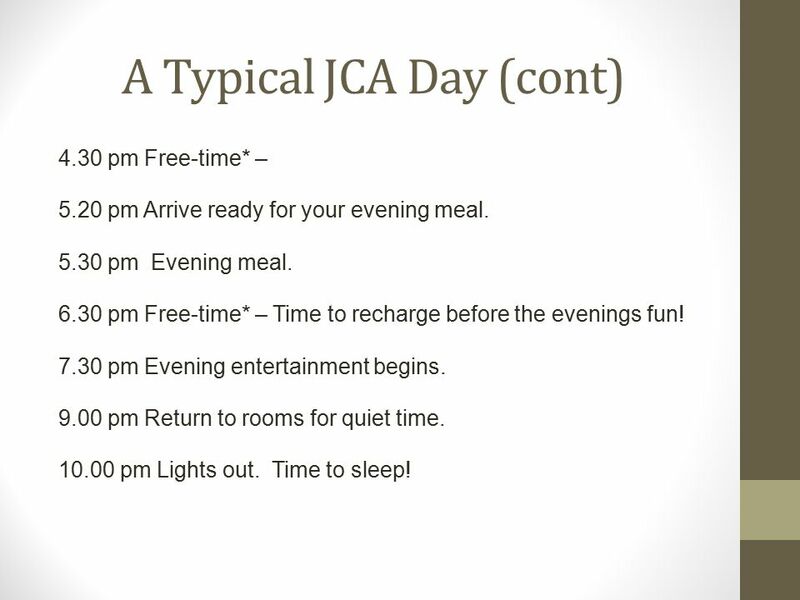 6.30 pm Free-time* – Time to recharge before the evenings fun! 7.30 pm Evening entertainment begins. 9.00 pm Return to rooms for quiet time. 10.00 pm Lights out. Time to sleep! 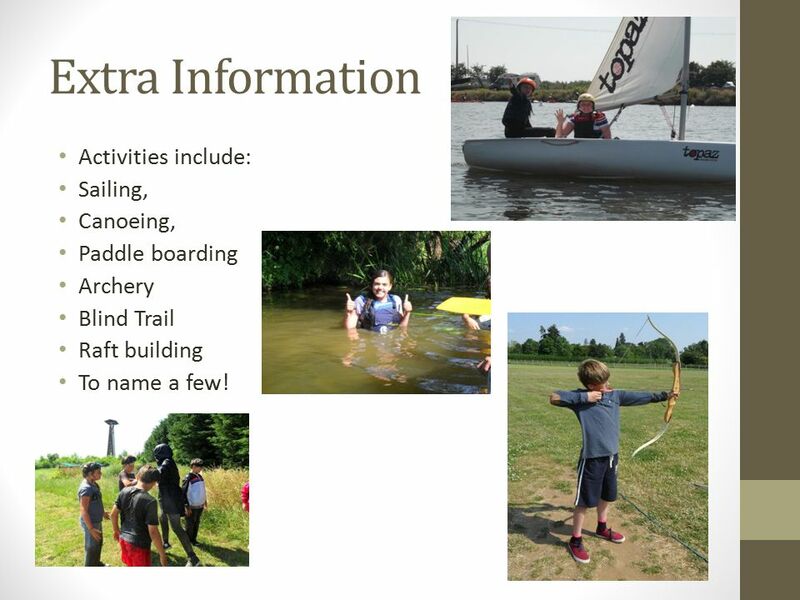 6 Extra Information Activities include: Sailing, Canoeing, Paddle boarding Archery Blind Trail Raft building To name a few! 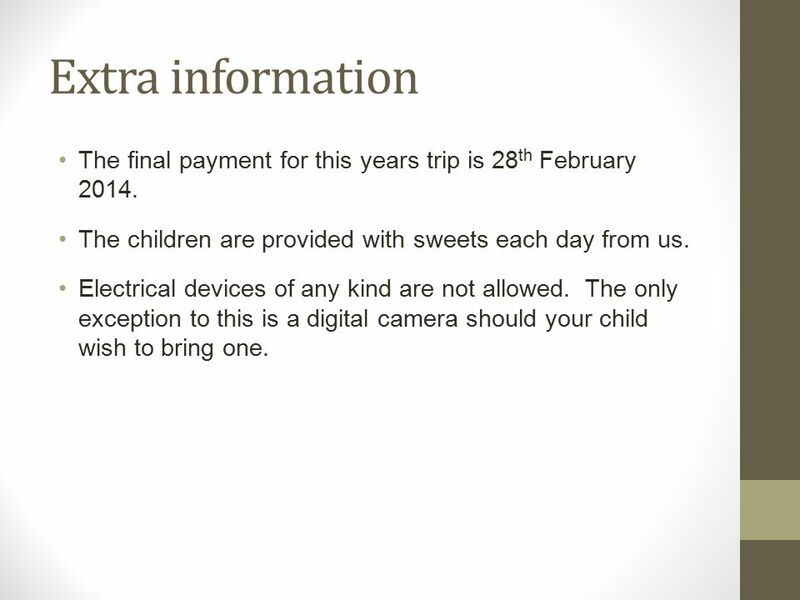 7 Extra information The final payment for this years trip is 28 th February 2014. The children are provided with sweets each day from us. Electrical devices of any kind are not allowed. The only exception to this is a digital camera should your child wish to bring one. 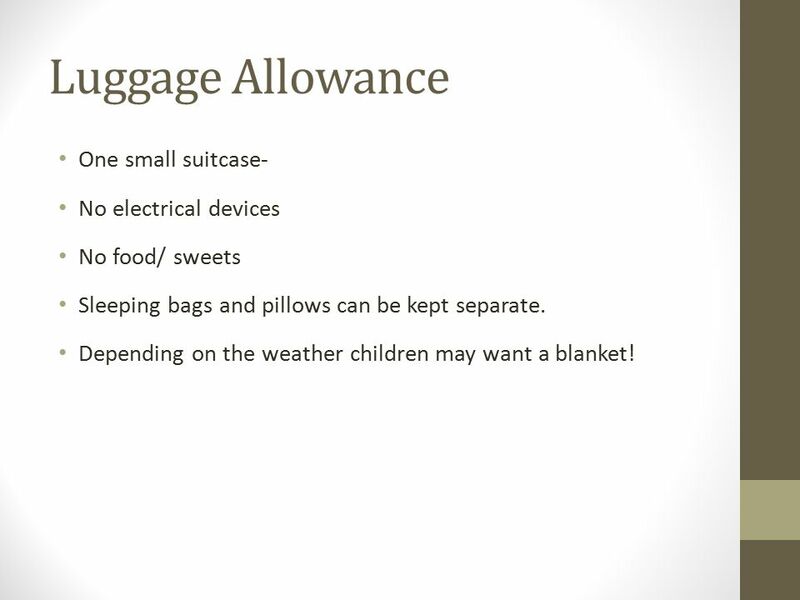 8 Luggage Allowance One small suitcase- No electrical devices No food/ sweets Sleeping bags and pillows can be kept separate. Depending on the weather children may want a blanket! 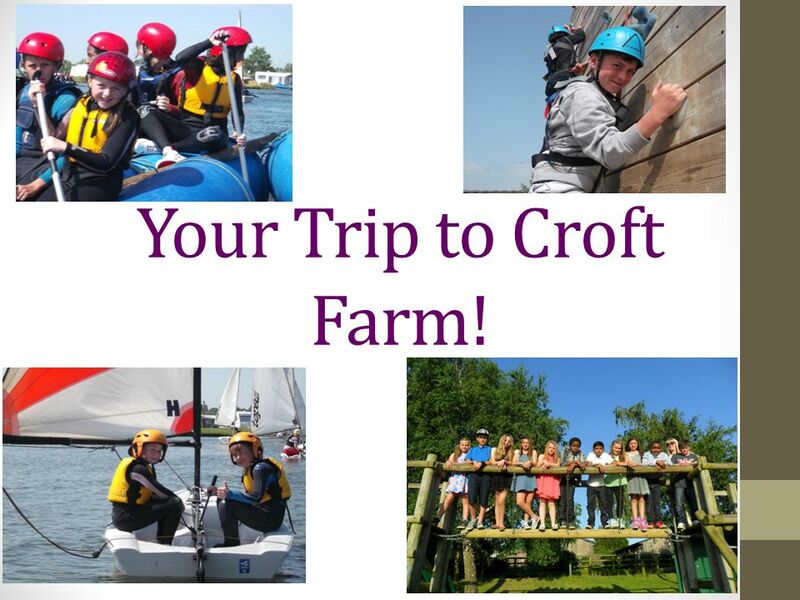 Download ppt "Your Trip to Croft Farm!. Accommodation! 4 person cabins Bunk beds Children will need to bring a sleeping bag and pillow with them." Year 6 Residential Trip Wednesday 28 th to Friday 30 th March 2012 Caythorpe Court near Grantham, Lincolnshire is a Grade II listed mansion house set. Camp Shady Brook September 22-23, Purpose  This field trip ties in with character education and helps students learn the value of working as a. Outdoor Science School Parent Information Night September 18, :00pm AGENDA Informational Video Parent Packet/Powerpoint Questions. 28 th -31 st October 2014 Year 6 Camp – Ern Halliday. 29 th June – 2 nd July Friday 29 th June 2007 Depart from school at 8am Arrive at Manor Adventure late afternoon - a packed lunch will be required. Danbury Camp 2014 Monday 30 th June – Friday 4 th July. Hilston Park. Hilston Park is an old manor house in the Monmouthshire countryside. It is close to Skenfrith, about 20 minutes from Abergavenny and 10 minutes. Condover Hall Meeting Wednesday 25 th February 5:30 – 6:00pm Agenda:  Activities  Health and Safety  A Typical day  Accommodation  What the pupils. Learning Outside the Classroom Name of school, date. 6 TH GRADE TRIP 2014/2015 Parent Meeting January 7, :00 PM. PGL Osmington Bay 30 th April – 2nd May Purpose of the Meeting To give final organisational details about the trip. Answer any question you may. School Journey 2015 Monday 7 th – Friday 11 th September Broad Haven, South Wales. Robinwood Trip to Dobroyd Castle 9 th – 11 th October 2013. Buckden Towers 4 th – 8 th July Buckden Towers Year 5 Residential Trip 2011 Reasons for taking the children to Buckden To encourage team building. Residential to Castleton Monday 9th March 2015 to Wednesday11th March 2015. 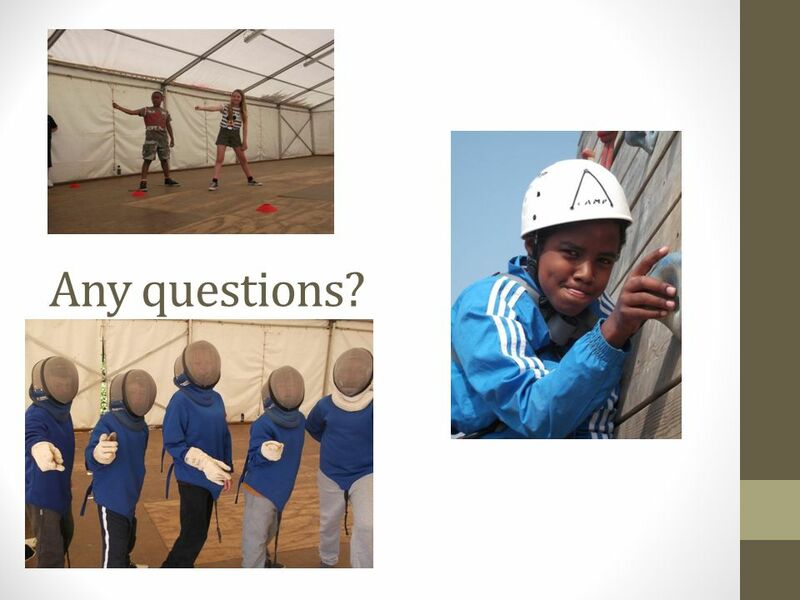 Welcome to the PGL information meeting (9th – 13 th March 2015) Agenda Introductions Organisation What the children need to bring What the children do. 6 TH GRADE TRIP 2014/2015 Parent Meeting January 7, 2015 6:00 PM.